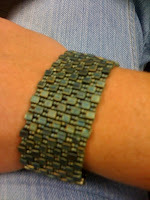 This bracelet was done with #4 cubes and #11 seed beads in the same color. It's an adaptation of a project in a circa 2008 Beads and Buttons magazine. I didn't care for the clasp design though so I just used a tube slide clasp. Nice and clean. I love it.